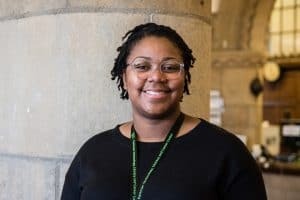 This week's PyDev of the Week is Qumisha Goss, librarian and PyCon US keynote speaker! Come learn about Qumisha, how she got her start with Python! I personally think you should take a few moments and watch the video. But if you don't have the time, you can still read this brief interview with this amazing person. Qumisha Goss, I go by Q. I'm a Librarian at the Detroit Public Library. I studied History and Classical Studies at Calvin College. I was obsessed with Mythology and then with the engineering of the Roman Empire. I wanted to be an Engineer and then an Archivist, and now I'm a librarian. I started using Python after I was encouraged to start a Kid's programming class at the Library. I started out using an hour of Code and Code.org resources, but as the kids got bored with that I taught myself Python to be able to teach them something a little harder and more resilient. Python is really my language; I have played around with SQL a little bit though for regular library business. Currently, I'm working on a Parkman Coders summer Program. 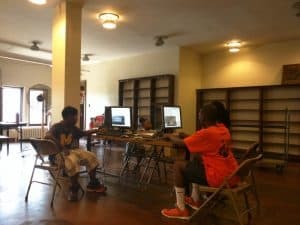 This summer the program is called Code:Grow where we will be encouraging the kids to go outside and plant a garden and then use Code to monitor their garden by making a time-lapse camera, and programming soil moisture sensors. PyGame because I work with Kids. What are the top three things have you learned contributing to open source projects? The Python Community is very encouraging. It's okay to ask for help and get it. I personally believe that learning should be free and open, and open source gives the opportunity to level the playing field for some who may not normally have the opportunity to access the resources they need. 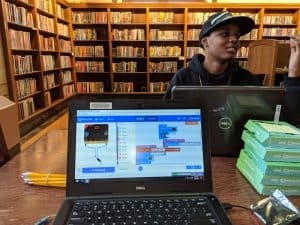 We work a lot with physical computing at the Library because we found that having something besides a computer to put their hands on encourages the learning process. So we often use Raspberry Pis and Micro bits.